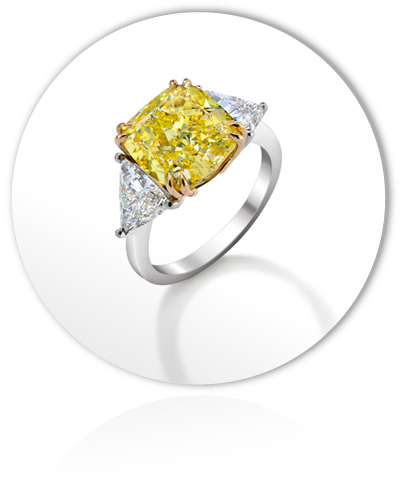 A vibrant fancy intense yellow cushion shape diamond ring, surrounded by two triangular-cut extra white diamonds, set with 18-carats yellow gold on a platinum band. One-of-a-kind. 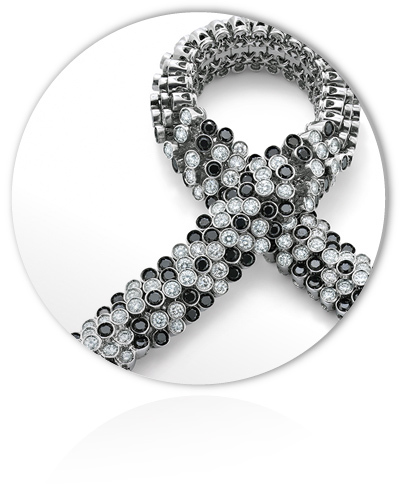 Black and white diamonds (12 cts), from the iconic Boa bracelet by NOURBEL®. A unique setting for a unique masterpiece. 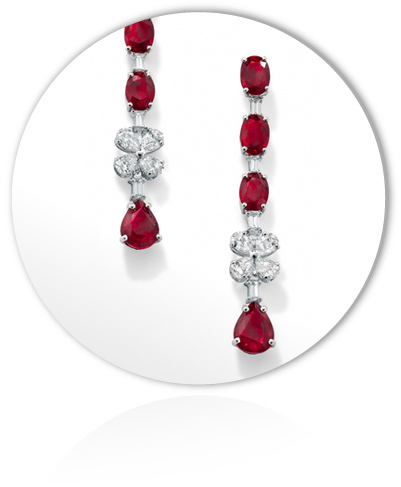 Also available in 25 cts with extra-white round brilliant diamonds. 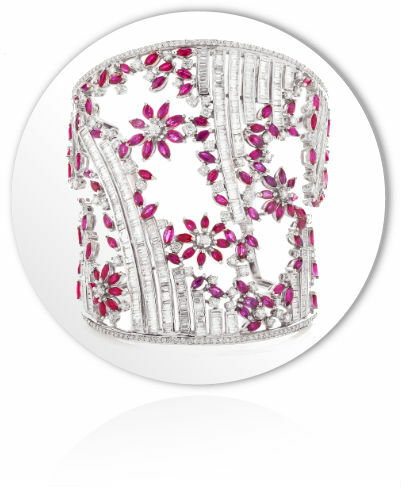 This unique cuff is delicately set with 11.5 cts of marquise shaped rubies with a combination of 16.75 cts of extra-white round brilliant and baguette diamonds finely set in 18-carats white gold. An exclusive design by Nourbel & Le Cavelier. 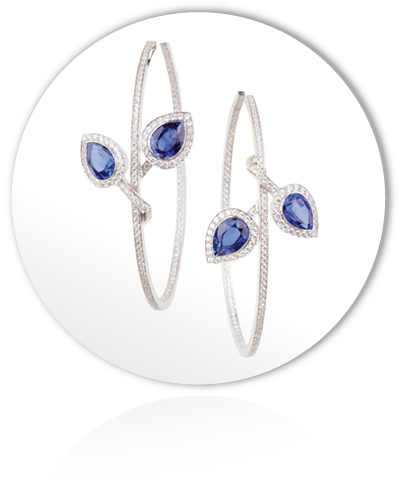 Sapphire and diamond leaf hoops in micro pave with their matching ring. 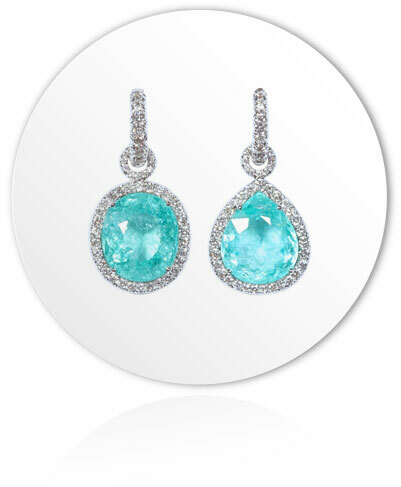 A pair of one-of-a-kind Paraiba earrings. Asymetical in shape the oval weighs 7.79 cts and the pear shaped weighs 6.65 cts, finely set in 18K white gold with a halo a 1.30 cts of extra white diamonds. Exclusive to Nourbel & Le Cavelier. 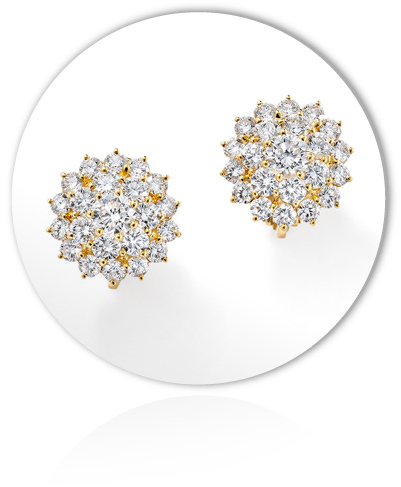 An elegant pair of diamond earrings, set with extra-white round brilliant cut diamonds (7.1 cts). One-of-a-kind. 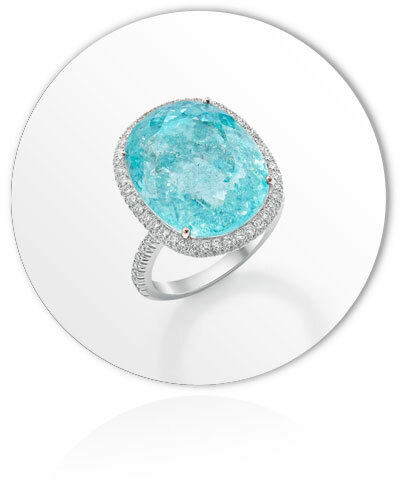 A rare and one-of-a-kind 18.57cts oval shaped Paraïba Tourmaline set in white gold with 0.92cts extra white diamonds. Exclusive to Nourbel & Le Cavelier.